Take a look and see if you don't share the dreams and goals I talk about at the top of this 2-minute video! THE SECRET SAUCE: You get a 30-minute blog review with me, live or on video (your pick!). You also get a month of email support + a 15-minute followup review, after you implement changes. This in-depth look at the specific tasks of the business of blogging was even more valuable to me than Jon Morrow's Guest Blogging course! Hi — Carol Tice here. Yes, I am a real person, and I live in the Seattle area. I was a longtime freelance writer before starting my Make a Living Writing blog in late 2008. By 2010, it began to earn for me, and by 2011, it cracked six figures. I share all the secrets and best practices I learned over years of trial-and-error for creating and earning well from a small, niche blog in SMALL BLOG, BIG INCOME. "Carol's got the best advice on earning from a small blog! "Dispels the myths small bloggers are prey to. "Better than a $2,400 class! "Shows you how a small blog really earns." It took me years — and a TON of mistakes — to learn the right way to create a lucrative blog with just a small audience. You don't have to waste the time I did, doing everything wrong off the bat — you can grab SMALL BLOG, BIG INCOME and use my proven, 7-step formula to discover the best ways to monetize your blog. Start down your path to setting your own schedule and living the location-independent lifestyle of a successful blogger! How can I tell if my blog could earn money? How can I get visitors to subscribe — and then buy things from me? How can I earn well when I don't have a lot of traffic? How do I figure out what to sell, and how to price my offers? 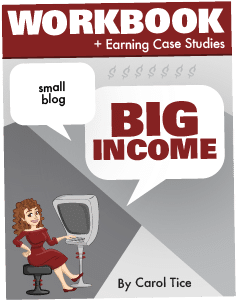 SMALL BLOG, BIG INCOME gives you a blogging blueprint that can take you from crickets to cash in the bank — fast! SEND MY E-BOOK + WORKBOOK NOW! Yes, you CAN earn big bucks from your blog — WITHOUT a huge audience! Wish you could figure out how to make money from your blog? Well, good news — in SMALL BLOG, BIG INCOME, I lay out the exact step-by-step formula I used to launch and build my Make a Living Writing blog, which now earns multi-six figures each year. Big blog gurus have advice that works great — if you've already got a ton of subscribers and traffic. BUT...That's not most of us! And that's why I wrote SMALL BLOG, BIG INCOME. I want to show bloggers the methods of building and monetizing a blog that work just great — even if you only have a small blog audience. This system is your ticket to financial independence as a blog-based business owner. Why should you get this e-book here, now? This site is the only place to get over 100+ pages of bonus materials included with your e-book purchase. Besides space for brainstorming and taking notes, the Workbook has 3 case studies, including one on how I built and launched what became a $300,000-a-year product -- when I had barely 2,000 subsribers. No need to wonder what's covered inside Small Blog, Big Income -- you can download the table of contents and introduction and see for yourself!